Welp, here it is. The new Wall. Possibly the Final Wall. Very definitely the Forever For Now Wall. Can you believe it? 2018 actually marks ten years of Frocks and Frou Frou, which seems just totally insane. I know some of you have been with me since the beginning – thank you so much for sticking with me through all the ups and downs. What a crazy ride, huh? It’s been a stinker in Melbourne over the past few days. Absolutely scorching hot. And as much as I totally adore our new pad, it doesn’t have air-conditioning. My lovely Mister has managed to borrow a portable air-conditioner that we’ve had cranking all weekend, and it’s the only thing that’s kept me from melting into a disgruntled puddle of sweat. It’s on the list of Things We’re Going To Do To The Apartment That We Now Own, Because We Can, Because We Own It. After this past weekend it’s near the top of the list. It’s probably even above saving money to get married, to be honest. It’s been pretty hot. 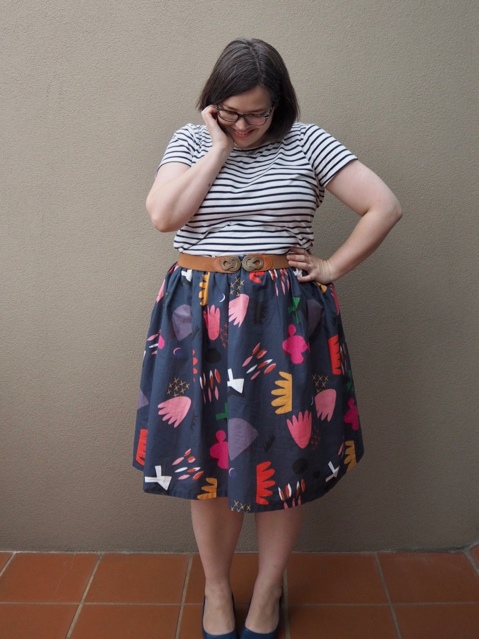 I’ve been sitting on this brightly-patterned “Cut Play” skirt from Doops Designs for a while now. 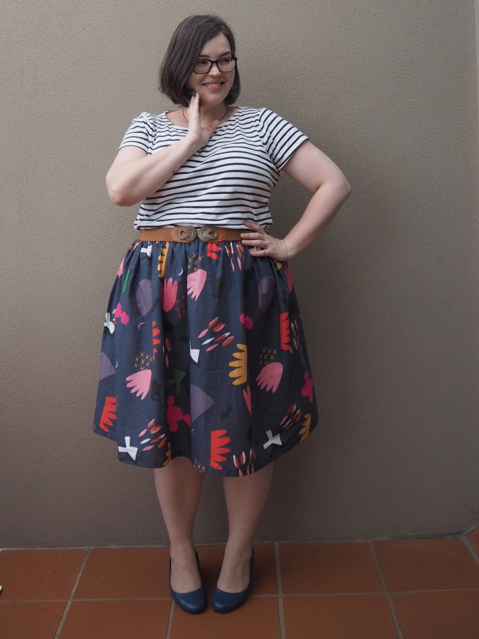 It’s the second skirt that I’ve bought from the Independent Australian designer (the first is here), and it’s taken me a while to wear it. 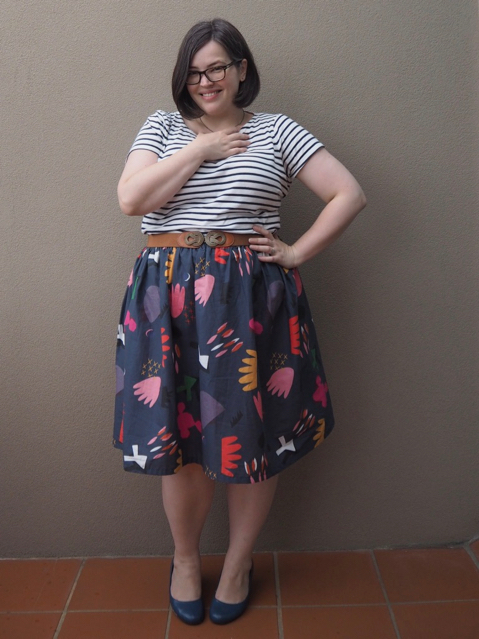 Unlike my Protea skirt I bought this one in the cotton fabric, rather than the silk and it’s… okay. The boxy shape is a lot less forgiving with the stiffer fabric, and though I love that the colours are more vibrant it’s just A Lot, you know? And I’m wearing less and less of this kind of bold, bright clothing these days. 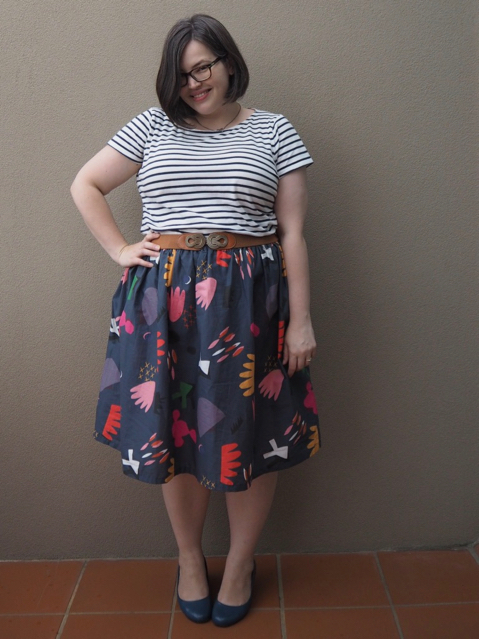 The skirt used to be a few inches longer, and I just couldn’t figure out how to wear it successfully. 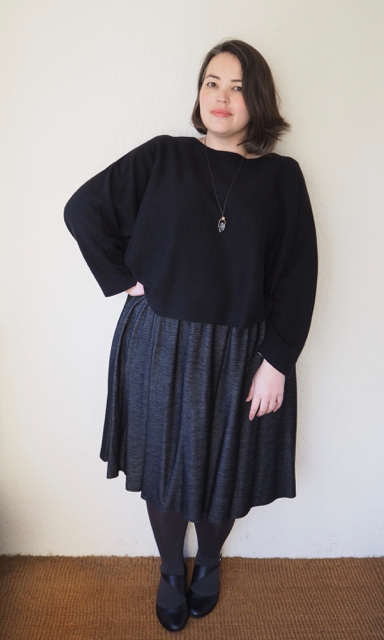 I had some grand plans about lopping the elasticised waistband off, and using the fabric to make a top, or a less frouffy skirt, but in the end I realised that just lopping a bit of length off the hem transformed it from Too Much to Just Enough. It’s fun, and bold, and bright, and perfect for summer with a stripy t-shirt. I hemmed it myself. Now that we’ve moved, and I have a dining table again I finally got my sewing machine back out. I’ve already made one new dress (it was semi-sucessful. I’ll write about in next week maybe) and I’m looking forward to getting back into sewing and dressmaking again. There’s something about winter that makes me crave comfort. Also summer. And spring. And autumn, I guess. 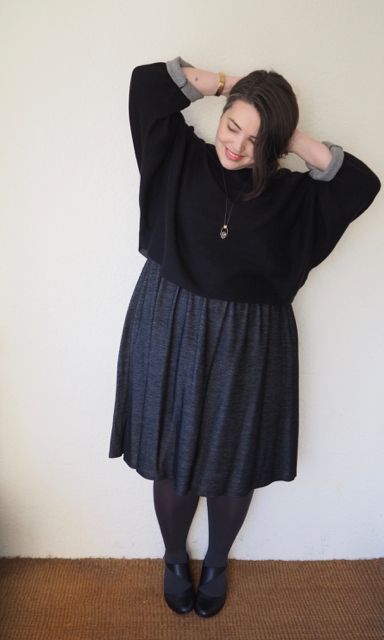 This layered outfit is – to the surprise of no one, I’m sure – a Very Comfortable Outfit. 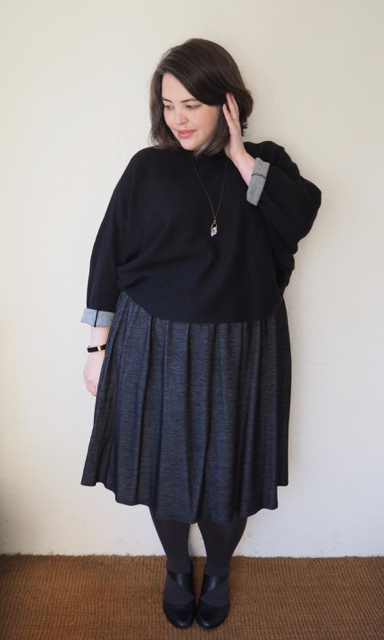 It’s snuggly and warm, and shapeless (but, like, the good kind of shapeless), and it’s basically been my unofficial uniform since the weather got cold. I’ve been living in my Sonsee opaque tights rather than trousers this year. I’ve blogged about my undying love for Sonsee before. They’re a wonderful, local company founded in 2013 by the very lovely Vanessa, and since then they’ve gone from strength to strength. The success of Sonsee is in no small part down to the fact that their tights are – hands down – the most comfortable, long-wearing, stretchy tights I’ve ever, ever tried (and trust me: I’ve tried a lot.) You can read my original review here – It’s worth clicking through just to see me fitting both legs into one side of the tights… Sonsee is really stretchy, guys – and I just want to let you know: That pair of tights I’m wearing in that photo from 2013? I’m still wearing them. In 2015 Vanessa appeared on the first Australian episode of Shark Tank, and won the support of entrepreneur Naomi Simson. It’s a partnership that’s allowed Sonsee to expand their product range into intimates and activewear, which allows me to live in my Sonsee tights in winter, and my Sonsee anti-chafing shorts in summer. They’ve also had a bit of a brand refresh, and I’m really liking the elegant new packaging. Online orders come wrapped up like a present in a shiny gift box, which is a nice little addition for shoppers (plus you can save $10 off your first order by signing up to their mailing list). Meanwhile. Have you ever just blown off an unfamiliar shop because you were sure they’d either be too expensive, or too small in size? It turns out I’ve been doing that with Tirelli, which has a fairly schmick and intimidating-looking shopfront in Melbourne Central. The windows are full of the kind of layered, architectural designs that I’ve been loving lately, but I was so sure their largest size would be a 12, and their prices would have an extra 0 at the end of them, that I’ve never been brave enough to go inside. A couple of weeks ago I saw this reversible knit in the window, and thought maybe I’d just have a tiny squiz. 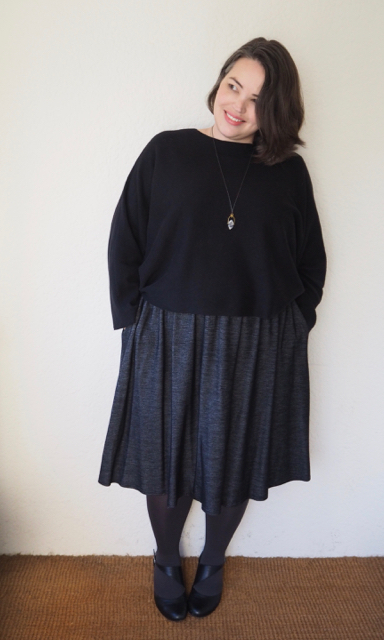 I ended up being pleasantly surprised – Tirelli goes up to a size XXL, which is supposedly a 16, but the shapes and cuts actually work fine for curvier bodies. It reminds me a little of the kind of fashion coming out of Universal Standard, Elvi and Coverstory, and oh man: I’d love to see more of it in the shops, because that kind of voluminous stuff either works, or it really doesn’t, and you never know unless you try it on. Finally, feast your eyes and your fidgety fingers on my current favourite piece of jewellery. 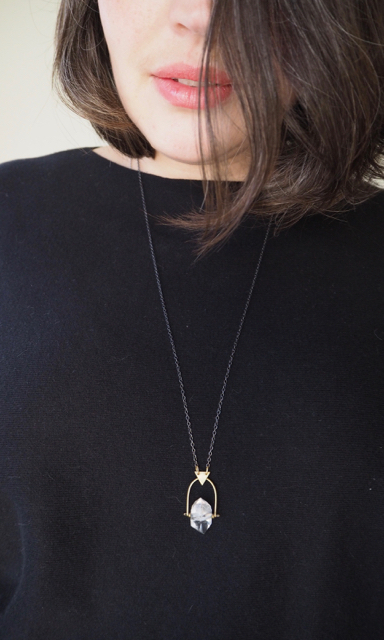 This faceted crystal spinner necklace was a self-gift from Etsy, and I adore it. The crystal spins freely with a little nudge, and I find myself twiddling with it non-stop whenever I wear it. It’s basically a classy, stylish, wearable fidget spinner.